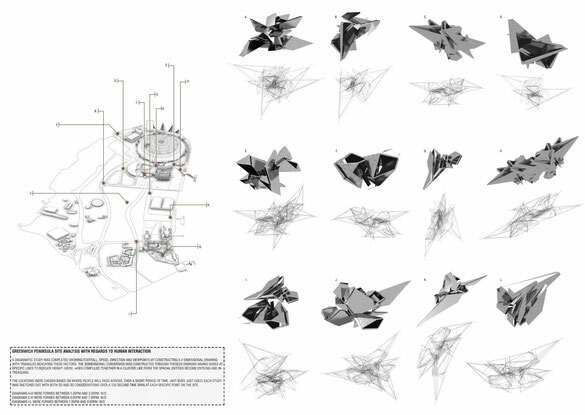 TERRAFORM - GREENWICH PENINSULA SITE ANALYSIS WITH REGARDS TO HUMAN INTERACTION - Website of tomphillips! A DIAGRAMMATIC STUDY WAS COMPLETED SHOWING FOOTFALL, SPEED, DIRECTION AND VIEWPOINTS BY CONSTRUCTING A 2 DIMENSIONAL DRAWING WITH TRIANGLES INDICATING THESE FACTORS. THE 3 DIMENSIONAL CONVERSION WAS CONSTRUCTED THROUGH THESE DIAGRAMS HAVING NODES AT SPECIFIC LINES TO INDICATE HEIGHT (VIEW). WHEN COMPILED TOGETHER IN A CLUSTER LIKE FORM THE SPACIAL ENTITIES BECOME ENTICING AND INTRIGUING. THE LOCATIONS WERE CHOSEN BASED ON WHERE PEOPLE WILL PASS ACROSS, OVER A SHORT PERIOD OF TIME. (NOT BUSY, JUST USED) EACH STUDY WAS SKETCHED OUT WITH BOTH 2D AND 3D CONSIDERATIONS OVER A 120 SECOND TIME SPAN AT EACH SPECIFIC POINT ON THE SITE.